This recent Case Study Report of the Paragonix SherpaPak™ Cardiac Transport System involved a long distance (over 1,100 miles) donor heart procurement. The Paragonix SherpaPak™ Cardiac Transport System demonstrated stable temperature maintenance during preservation and provided for excellent graft function post-implantation. The recipient patient was a male patient with a history of cardiomyopathy and heart failure requiring heart transplantation at a leading Boston teaching hospital. A female donor was identified in the Southern US. Infectious disease results indicated the donor was Hep C Ab+ positive; however, NAT testing was negative. Prior to donor heart cross clamp, three (3) liters of cold preservation solution were decanted into the sterile Paragonix SherpaPak™ organ canister, which is designed to hold the heart. Prior to placement within the organ canister, the heart was flushed in situ with two (2) liters of cold preservation solution, recovered, and then placed in a basin with slush for inspection and insertion of the Paragonix SherpaPak™ Heart Connector into the aortic root. A patent foramen ovale was identified and repaired in the basin. The Paragonix SherpaPak™ Heart Connector was attached to the aorta using umbilical tape. The heart was then anchored to the organ canister, which was quickly assembled and inserted into a second rigid sterile outer canister designed for additional protection and serving as a second, rigid sterile barrier. The final assembly was then placed into the Paragonix SherpaPak™ Shipper, which had been previously preconditioned with the Paragonix SherpaCool™ material. Continuous and real-time temperature monitoring and recording was initiated from within the inner canister via an integrated thermocouple probe. The donor heart was now prepared for air transport back to Boston. Flight time from the Southern US back to Boston was approximately 3 hours. 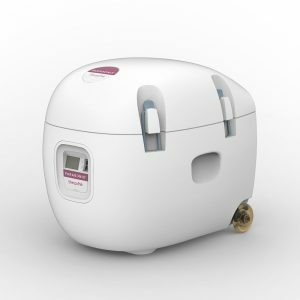 According to the transplant team, time of the donor heart removal from the Paragonix SherpaPak™ Shipper and sterile Organ Canisters was considerably shorter and less involved than previous experiences with the ice chest method involving bags or plastic containers. Upon removal of the donor heart from the Paragonix SherpaPak™ CTS, temperature records were downloaded and reviewed. The total time of storage and preservation within the Paragonix SherpaPak™ CTS was 205 minutes. The total ischemic time was 312 minutes. 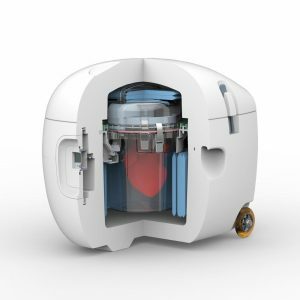 The initial preservation solution temperature within the Paragonix SherpaPak™ Organ Canister holding the donor heart was 5.33°C, with a mean temperature of 5.51°C. The lowest temperature recorded during the transport was 4.48°C and the highest temperature recorded was 6.20°C. These temperatures were within the operating range of 4 to 8°C for optimal preservation and prevention of frostbite and cold damage. The entire Paragonix SherpaPak™ CTS occupied one seat in the aircraft, was easily secured using a conventional seatbelt, and was easily wheeled to and from the aircraft and to the recipient OR. The patient did well without complications coming off bypass; graft function was excellent. Postoperative TTE showed normal LV and RV function with 72% of LVEF and RHC showed low normal filling pressures and normal cardiac output. Download – The Ice Age is Over!